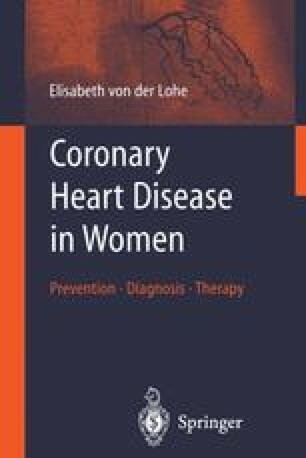 Coronary heart disease continues to be an infrequent disease in premenopausal women, even in women with diabetes mellitus; however, after menopause (the time when estrogen production decreases) the prevalence of coronary heart disease in women increases with increasing age and reaches that of men by age 75 years. Women with premature menopause (<35 years of age) regardless of etiology (either natural or after ovariectomy) have a twofold higher risk of coronary heart disease (Wenger et al. 1993). These findings led to the conclusion that estrogens are cardioprotective and play a major role for the low prevalence of cardiovascular disease in pre-menopausal women; however, the role of estrogen (and other hormones) in the pathogenesis of coronary heart disease is still under investigation.